From the moment of purchase, pristine objects are subjected to an array of stimuli including wear, impact, heat, light, water and air which alter their tactile and aesthetic properties. Material change is often regarded as ‘damage’ or ‘degradation’, but has potential to be used as a tool to engender emotional engagement with an object. Currently, materials resources for designers and design education do not provide information about how materials will change with use and environmental exposure. Senso-aesthetic responses to material change (over time, with use) are fundamental to enabling designers to select materials which meet users’ expectations whilst delivering optimal lifetimes for products, interior and architectural applications. 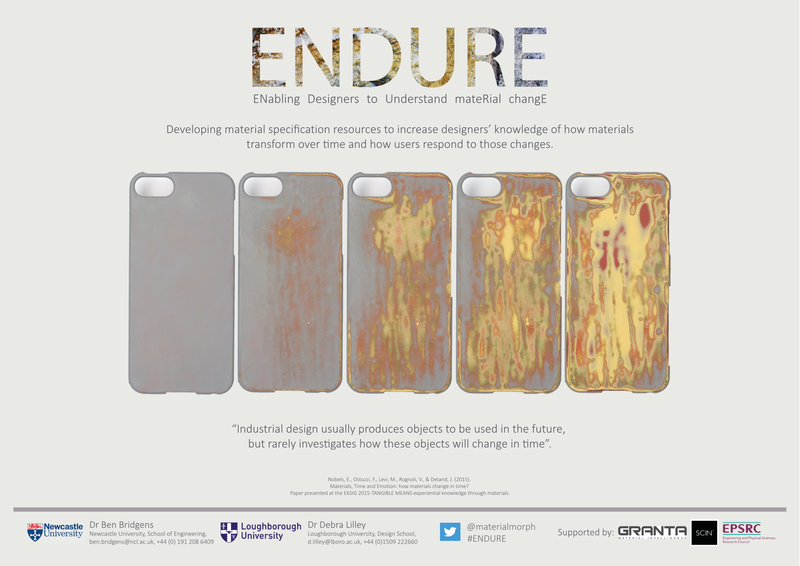 The ENDURE project is an EPSRC funded collaboration between Loughborough Design School, Newcastle University School of Engineering, Granta Design and SCIN, which aims to develop prototype plug-in resources for Granta Design’s CES Edupack materials specification software, and SCIN’s physical and online materials library, to increase designers’ knowledge and literacy of material change (wear, ageing, damage etc.). These resources will overcome limitations of existing material selection resources (libraries, catalogues, databases) which typically neglect sensorial aspects of material change in favour of functional durabliity, and will enable these aspects of material selection to be incorporated in design education.